Dr. Abid Hussain is a Pakistani doctor working as a General Practitioner for 3 years in Al Noor Polyclinic, Satwa. 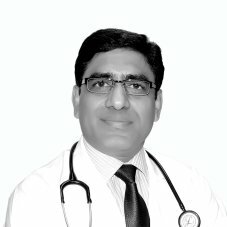 He has a vast experience of 18 years working as a General Physician / Family Medicine in Pakistan, Saudi Arabia, and UAE. Dr. Abid has completed his MBBS degree in 1992 from Punjab Medical College Faisalabad, Pakistan. His post-graduate qualifications include MRCGP Int. Masters in Health Administration and Masters in Maternal and Child Health. He is a member of Royal College of General Practitioner (MRCGP Int) UK since 2014. He is multilingual and has the practical knowledge and skills to manage a wide range of medical / surgical / emergency cases including acute and chronic conditions. His specials interest includes Primary Health Care, Sexual Health problems, Infectious Disease, Travel medicine, Minor surgical procedures including ingrown nail, abscess drainage, wound suturing, chronic conditions like Diabetes Mellitus, Hypertension, Arthritis, etc.